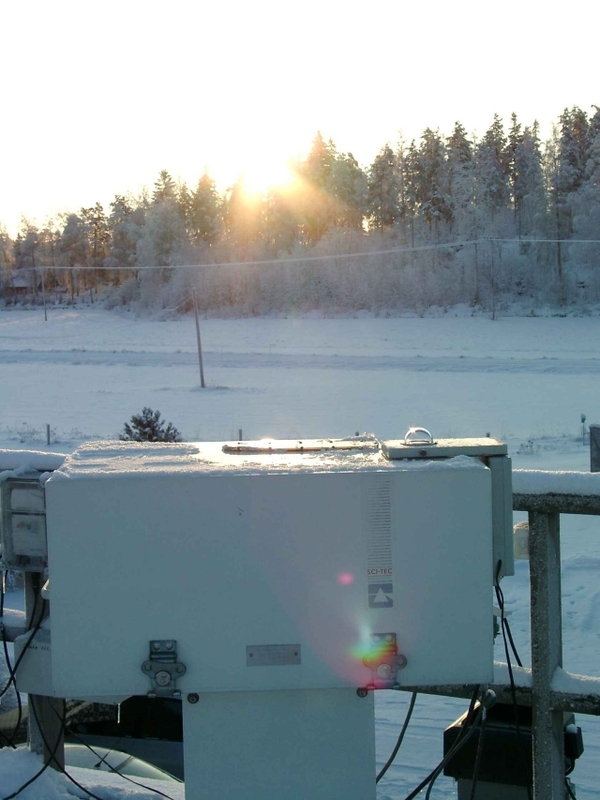 The PROMOTE UV Record erythemal daily doses based on the EP/TOMS measurement data were compared with the daily doses determined from the spectral UV measurements made with a double monochromator Brewer instrument at Jokioinen observatory. Jokioinen is located in the Southern Finland (60.81N, 23.50E, 104 amsl) and climatologically it represents boreal forest region. The Brewer instrument of Jokionen is shown in Figure 1. Eight year of data (1997-2004) were included in the comparison. 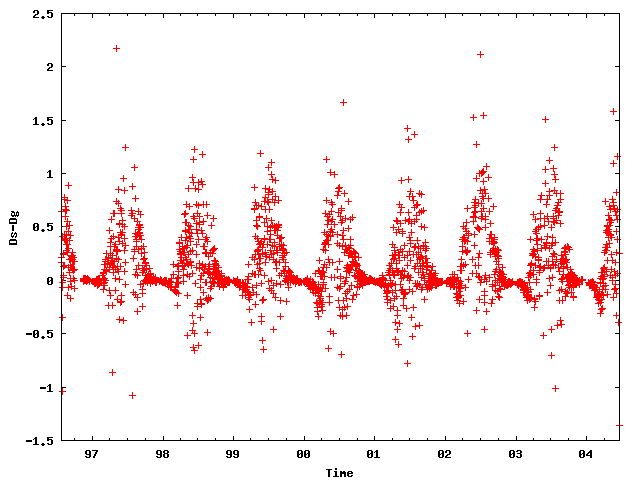 The overpass satellite data for Jokioinen were prepared by selecting the satellite observation closest to the ground station and that was made within 12 hours from the local solar noon. The reference daily doses were calculated as integrals from erythemal dose rates calculated from cosine corrected Brewer spectra using trapezoid rule. Several criteria were used to ensure that the coverage of the spectral measurements was sufficient for accurate determination of the daily doses. The overall number of validation data pairs was 2156, ie. covering some 75% of the time period under study. It should be noted that the satellite retrieved and ground based dose values are not fully comparable and also the ground based data involves some uncertainty. Because of the relatively large ground pixel size, the satellite retrieved dose values represent average dose value for a larger region that those based on the ground based measurements. Therefore, satellite retirevals are problematic for regions with large variation in albedo or topography. Figure 1. Brewer instrument in January 2002 in Jokioinen. In Figure 2 are shown both the satellite retrieved erythemal daily doses for Jokioinen and the daily doses defined from the Jokioinen Brewer measurement data. 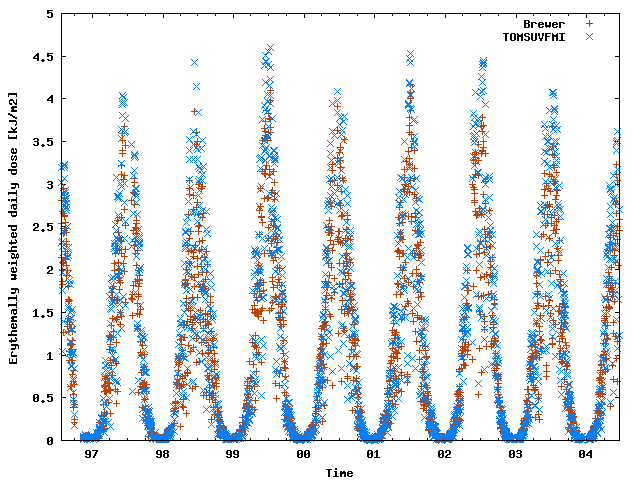 Figure 3 shows the satellite daily doses (Ds) as a function of the Brewer doses (Dg). 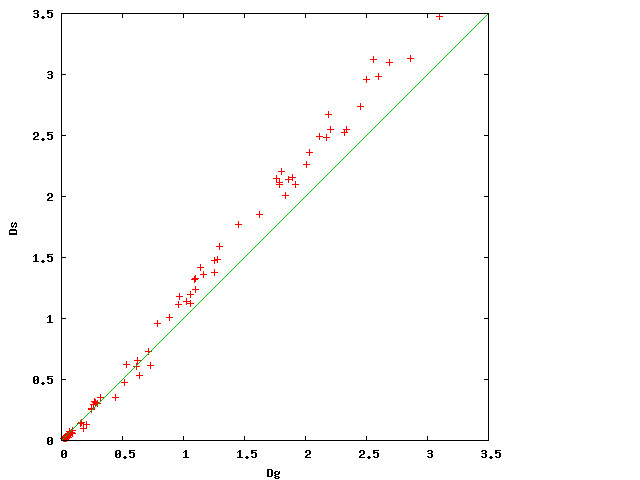 Figures 4 and 5 show the absolute (Ds-Dg) and relative (Ds-Dg)/Dg differences of the two data sets. Naturally, the absolute differences are largest in summer, as the daily dose values are largest. The relative difference reveals a seasonal pattern: satellite retrieved doses are on the average some 15% larger than ground based doses in summer, while in winter they are smaller than those derived from the ground based measurement data. The summertime positive bias of the satellite retrieved surface UV is in accordance with previous validation studies and can be at least partly addressed to absorbing aerosols that are not currently taken into account by the surface UV retrieval algorithm. The wintertime negative bias is not as serious problem, because the dose values are in general very low. However, it could be explained by an error in the assumed surface albedo. Figure 6 shows the histogramm of the relative differences between the doses. Clearly, the distribution is skewed and peaks at some 15%. The percentage of the data pairs within 10%, 20% and 30% from each other are 22%, 47% and 67% respectively. Figure 2. Satellite retrieved and Brewer measurement based erythemally weighted daily doses. Figure 4. Absolute diffrence between the satellite retrieved and the ground based daily dose. Figure 5. 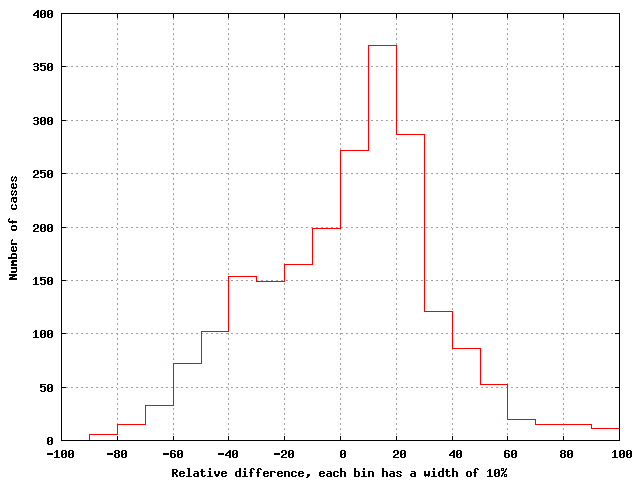 Relative diference between the satellite retrieved and the ground based daily dose. Figure 6. Histogramm of the relative difference between the satellite retrieved and ground based daily doses. In addition to daily doses monthly average daily doses were determined and compared. The averages were calculated requiring that sufficient number of faily dose values were available for each month from both the satellite and ground based measurements. This resulted in 80 monthly average pairs. Figure 7 shows the correllation between the monthly averages based on the satellite retrieval (Ds) and ground based measurements (Dg). The positive bias in the monthly average satellite retrieved daily dose is naturally the same as that for daily doses, but now the variance is significantly smaller. There is a good explanation for this: the cloud correction of the satellite retrieval algorithm involves much uncertainty because it is based on a single observation of the cloud conditions. 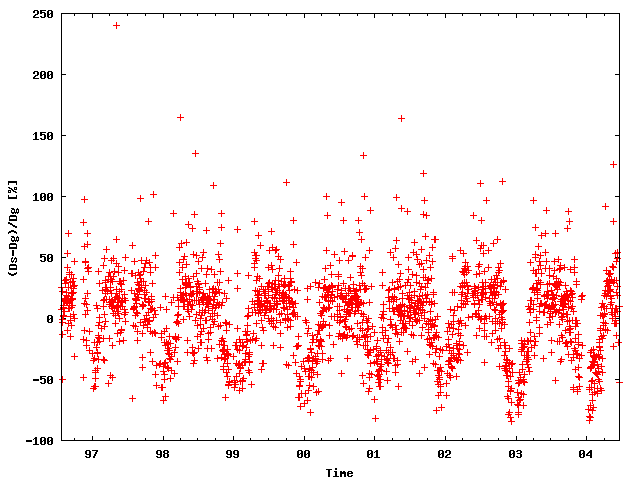 However, these observations can be considered as samples of the true cloud information, and therefore the uncertainty decreases as more samples on the cloud conditions are used to calculate the average. Figure 7. Monthly average satellite retrieved daily dose (Ds) as a function of the monthly average ground based dose (Dg). The statistical results of the validation comparison are summarized in Table 1. The mean error and the relative mean error for daily doses and for monthly averages differ because in the set of daily doses there were some gaps in data, and thus, when monthly averages are calculated the wintertime data (which tends to give negative bias) are given more weight. Table 1. 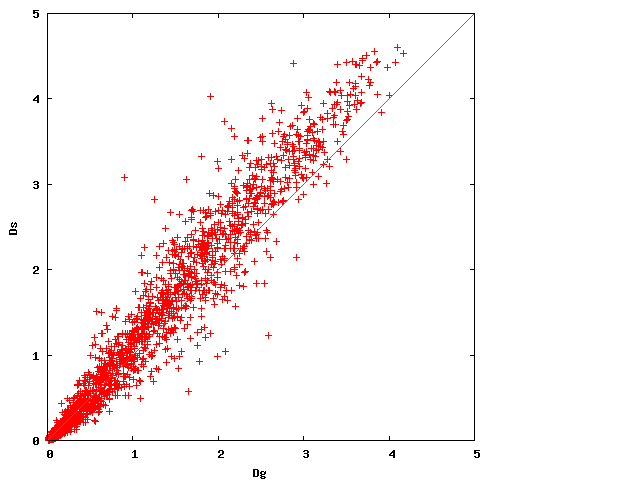 Results of the statistical error analysis. This validation study does not give a complete picture of the quality of the UV Record data. However, some general data features were established. At least for Jokioinen, the TOMSUVFMI surface UV algorithm tends to give too high daily dose values in summer and too low doses in winter. Thus, there is a need to improve the surface UV algorithm to better account for absorbing aerosols and seasonal changes in surface albedo. The variance of the daily dose is high, but decreases substantially for monthly averages. The daily dose values could be improved provided that more data was available on the diurnal variation of the cloud conditions.